Context: On 25 December 2017, dalit bahujan students of Satavahana University in Karimnagar, Telangana, held an event outside the campus gate in front of the Jyotiba Phule Statue to burn “Manusmriti”. This programme is done every year on 25 December to keep the spirit of first such event conducted by Dr Babasaheb Ambedkar in 1927 alive. After the students finished the event of symbolically burning text from the Manusmriti (not from a book but words from the text written on large chart sheets), and were walking back to the hostel, a local BJP politician and his supporters from RSS-affiliated organizations arrived at the University with sticks. They came inside the campus and attacked these students who were very few numbers, meanwhile others went to hostel and brought other students to resist this attack by RSS. As this clash continued, RSS members from outside the University joined in hundreds and Satavahana students also came to the scene in big numbers. Not one of these RSS members was from the university and some of them have criminal cases on them. According to the injured students Mahesh, Arun and Vinod, some people owing allegiance to the BJP/ABVP came to the Mahatma Phule statue just outside the Satavahana University campus main gate where the students had gathered to burn the copies of Manusmriti. When the students resisted disruption, a violent clash ensued between the two groups. Several students were injured in the physical assault and stone-pelting. When the Sangh Parivar group arrived, they raised slogans, “Rajyangam vaddu, Manusmriti muddu” (“Don’t want the Constitution, Manusmriti we love”). Some phones belonging to the students who were recording the event were taken by the police and some phones went missing in the melee, and the police were yet to return the phones as of our meeting on 2 January 2018. The police rounded up several students and held them at police stations on the outskirts of the city. There is a CCTV camera outside the campus gate, which is under the control of the local police. But the police had so far neither revealed nor used the footage to bring out the facts of the assault on students by an outside political group. As of now, both the administration and the police are claiming that the political group did not chase the students and enter the campus. The police also did not allow students to visit their friends who were undergoing treatment at the hospital after getting injured, while threatening them with non-bailable warrants and rowdy-sheets. Some of the detained students were threatened by the police for being anti-Hindu and demanded a written assurance from the students that they will not participate in any political activities if they wish to be released. However, according to the Registrar, Prof. Komal Reddy, whom we later met, no cases have been booked against the students. Neither have any cases been booked against the BJP affiliated men who assaulted and injured them. The University is working under an acting Vice-Chancellor, an IAS officer Mr Chiranjeevulu, whose primary charge happens to be that of Commissioner, Hyderabad Metropolitan Development Authority, which is based in Hyderabad. The administration is done through the Registrar. This has been broadly the fate of Telangana Universities ever since the TRS government assumed power in 2014. Most Universities in the state do not have regular Vice-Chancellors and Executive Councils for efficient functioning. On the day of the disruption and attack on students, neither the VC, Prof Sujatha, Prof Komal Reddy nor Assistant Registrar, Mr Kishore, were on campus. When the Telugu channels began running the news scrolls about the events by about 10.30 am on 25 December, the Registrar and Assistant Registrar headed back to the University. By then the Commissioner of Police of Karimnagar, Mr Kamalasan Reddy, discussed the events at the University with the Vice-Chancellor over phone and persuaded him to close the University and vacate the hostels. By the time the Registrar and the Assistant Registrar returned to the campus, some 500 students, who were about to sit for their term exams, were told to vacate the hostels and leave for their homes. Due to the very short notice, many of the students did not have the resources to pay for trains and buses to their home-towns. Some of the students also claimed that the girl students were left to fend for themselves and some of the girl students were stranded at the railway and bus stations till midnight. The Registrar denied this saying that by the time he returned to campus at about 3 pm, most students had already left. We could not independently verify this as most students were either still returning to the campus or were busy with their exams, and those who were around were reluctant to speak about the incidents of 25 December 2017. The Registrar also claimed that the students were asked to go home as work for the installation of an electrical transformer was going on and there was a problem of power and water supply on campus. Attacks on Prof Sujatha who was not there: The BJP group, however, promptly began to say to the media that the students were burning the image of Bharatmata and the Indian flag. They began targeting the well-known Professor of Sociology Surepally Sujatha, who is now the Principal of the College of Arts and Commerce of Satavahana University (SU). Prof Sujatha has been an activist espousing a range of causes like dalit and minority rights, right to the commons, environment and land rights apart from being a women’s rights activist. She was also in the forefront of the movement in support of Rohit Vemula. She has a wide following and is known to be the go to person whenever any atrocity cases against dalits come up in Telangana. 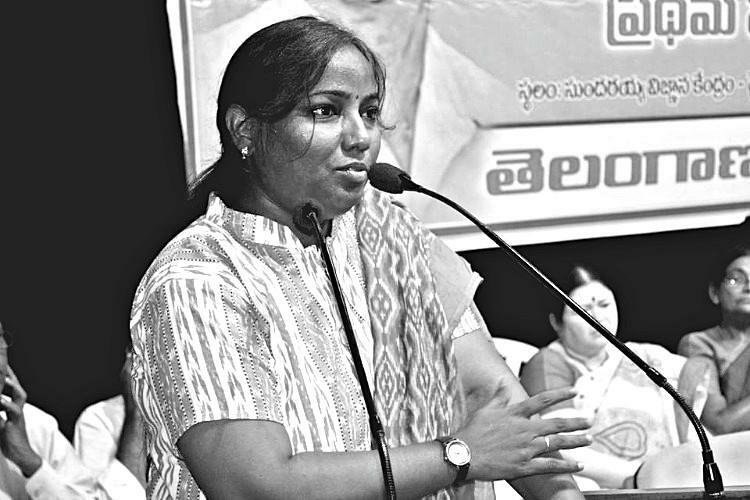 In a recent instance, a video of a BJP leader, Bharat Reddy from Abhangapatnam, brutally assaulting dalits became viral and she was one of the activists who moved the National SC Commission and the NHRC (https://www.youtube.com/watch?v=3VPdiDkxxII) that led to the arrest of Bharat Reddy. Before this there were a series of atrocity cases where she anchored the protests and supported the victims. The strategy of the BJP after the SU events has been to call press meets and feed the media the Bharatmata story, repeatedly claiming that the students were misled by Prof Sujatha into doing anti-national activities. They have dalit spokespersons, Muslim and Christian spokespersons who come and spin the story as an anti-national event where Bharatmata’s image and the flag were burnt. None of the photos show any such thing and the CCTV footage is in the possession of the local police. No one presents any evidence. The media does not ask for any nor does it counter-question. All their press conferences have been targeting Prof Sujatha, who was neither present at the event, nor was she in town on that day. There have been loud debates on HMTV, TV9 and other Telugu TV news channels all providing mileage to the BJP spokespersons to malign Prof Sujatha and the dalit students with the anti-national tag. There is an orchestrated campaign now to remove Prof Sujatha from her position in the university. On social media, Facebook in particular, they have unleashed an abusive campaign against Professor Sujatha, calling her Surpanakha. The followers of that post have held out personal threats of mutilation and sexually explicit abuses, even as they are interspersed with Bhatamatakijai (https://www.facebook.com/pillalamanmadha.vedhaas/posts/201629197066442). This post also includes threats from his followers to subject Sujatha to the fate of Gauri Lankesh, a well-known journalist who was shot down in front of her own home. Another follower recommended that she should be shot. The person who has abused on this Facebook post is also holding out threats to Christians. In a statement given to a local channel Bharat Today, Bandi Sanjay, a BJP person who is leading this campaign, can be heard raising communal issues against Christians, saying dalits who have converted to Christianity are continuing to take away the reservation benefits from dalits who have not converted. He also said that Christian missionaries are instigating the dalit youth to indulge in activities against the nation, all without a shred of evidence (https://www.facebook.com/puli.srinu.7/videos/745532742309713/). We do not know what else is being spread on WhatsApp. Come election time, Indian political parties get energised both on the streets and on media, attempting to capture for themselves more mind-space of the voters. Among all the political parties, BJP and its various tentacle organisations seem to have perfected this art. Telangana state elections are nearing in 2019. BJP and its affiliate organizations have activated their cadre through one of its state leaders (https://www.deccanchronicle.com/nation/current-affairs/271217/bjp-will-come-to-power-in-telangana-says-party-president-laxman.html) already declaring that BJP will form the next government in Telangana. The violent statements made by the BJP MLA from Hyderabad on film Padmavati (http://www.news18.com/news/india/telangana-bjp-mla-threatens-to-set-ablaze-theatres-that-screen-padmavati-1569439.html) made it to national headlines promptly. There are other local leaders of BJP helping to manufacture headlines for the party, mostly focused on the caste and communal agenda that appears to be the platform for the 2019 state and national elections. The most recent such incident that is occupying media attention in Satavahana University targeting Sujatha Surepally is based on the HCU/JNU formula. This is the same playbook playing out as elsewhere in the country. Create a ruckus based on a false narrative, spin it as anti-national through media channels, which are happy to run aggressive stories as long as they garner TRPs, and run an abusive campaign on social media maligning specific people who are seen as the voices of any social movement. The BJP has been pro-actively setting the communal agenda well before an election. Through the controversies created on the ground they get the compliant media to cover the issues and escalate them further through social media channels. The coverage on media works insidiously. Prof Sujatha said that the media routinely carry everything from the press releases/ press conferences the BJP wings give out while ignoring her rebuttals or clarifications. For instance, on the day of the event Prof Sujatha was not in Karimnagar. She came to know of the incident later. But the BJP spokespersons have made her the central figure in their campaign, claiming that she encouraged the students to indulge in burning the picture of Bharatmata, when no images of Bharatmata were at the protest site. The media coverage has not bothered to emphasise this. The public perception spread through the mainstream media about JNU students and faculty through fake videos is being attempted to be milked further here, trying to paint some teachers and students as anti-national. The BJP has been fielding dalits as spokespersons on media to justify their activities. They loudly proclaim their identity and claim they are the true inheritors of Ambedkarism. This is much like Muslims in BJP coming to invariably skirt and fire-fight lynchings and threats to the Muslim community. Television channels create a false equivalence of the victims of crime with the perpetrators by giving airtime to people accused of violence and giving them an opportunity to justify themselves. This attempt at neutrality is also helping the party build up new leaders. A Raja Singh here, a Bandi Sanjay there shoot into media visibility by indulging in outrageous activities and also repeatedly succeed in getting away with it. It has become a sure formula for ensuring their consolidation as leaders. A factor that strengthens their bid for local leadership is lack of any police action against threats of physical assaults and criminal intimidation. Prof Sujatha complained in writing to the Police Commissioner of Karimnagar with details of the kind of online harassment she is being subjected to. The Police Commissioner told the media later that there is no case other than perhaps defamation, for which Sujatha may file a case in Court if she chooses. When the fact-finding group met the press at the Karimnagar Press Club, we emphasised the fact that there were open death threats against Sujatha and it was highly condemnable that the Police Commissioner does not file any case or register a complaint around online harassment, incitement or abetment to murder and criminal intimidation against the abusive group whose identity is still available in public Facebook posts. People have been routinely arrested and punished for sharing jokes about political figures, but no case was visible to the police in this instance. Sujatha’s security must be ensured. All harassment of students who were involved in the Manusmriti dehen program must be stopped immediately and no cases should be booked against them as, if there was no external attack on them, the event would have passed peacefully as it used to in previous years. Cases must therefore be filed against those who assaulted the students.